The cold temperatures and permafrost have been considered by Arctic countries as a mode of confinement and an eternal repository for pollutants. But for several years, it has been known that rivers, lakes, and groundwater have been contaminated by the migration of pollutants originating from landfills and other contaminated sites. This mobilization of pollution comes from temperature fluctuations, melting snow, rain, changing levels of groundwater and flooding. The ice has not fulfilled its purpose as a cocoon in trapping pollutants. With global warming in view, the progressive rupture of the “cold chain” would be an ecological disaster and would accelerate the release of waste. Robin des Bois has achieved, after a year of work, a consolidated international inventory of polluted sites in the Arctic through available information and correspondence with authorities from the United States, Canada, Greenland, Norway, Sweden and Finland. Russia did not respond to any of Robin des Bois’s requests for information. This inventory concerns sites polluted by metals, chemicals, and/or domestic waste and excludes radioactive pollution which will be the subject of further research. The main activities causing the contamination of soil, its adjacent waters, and groundwater are: military and scientific bases; exploring, exploiting, and distributing gas and petrol; tank farms; and mine and steel complexes. The principal pollutants are hydrocarbons, heavy metals, asbestos, PCBs, and other Persistent Organic Pollutants (POPs). The information on polluted sites (when available) and their summaries reveal negligent practices due to a lack of knowledge and to the hasty waste handling in effect in hostile and nearly uninhabited areas. PCBs and specific metals were used as additives in drilling fluids. “Road Oiling” consisted in spreading on tracks a mixture of dead and used oils, PCBs and antifreeze to reduce airborne dust. Military bases used DDT on a large scale and one common way to eliminate drum wastes was to transport them to frozen lakes in winter and wait for the ice to melt, allowing the drums to sink to the bottom. Consequently, the national inventories and more precisely the State of Alaska in the US, and the Territories of Canada Yukon, Nunavut and the Northwest should not be considered exhaustive. Pollutants also contaminate food webs. 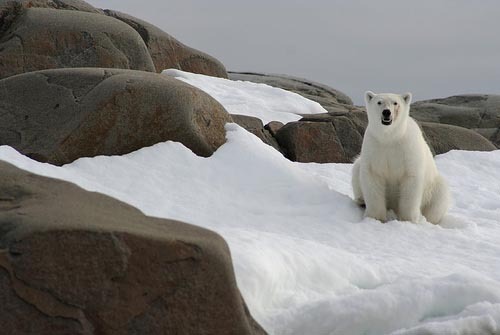 Some populations of polar bears are viewed today as spectacular victims of global warming; they are meanwhile victims of decades of chronic internal PCBs and insecticide contamination. Inuits and other indigenous communities of the Arctic whose diet consists of aquatic resources and other game are poisoned as well. The Arctic is the target of pollutants externally transported by atmospheric and oceanic currents but the compilation and maps of Robin des Bois show the Arctic is also threatened by internal pollutants. Almost all of the polluted sites border the Arctic Ocean, lakes or rivers. These contaminated sites are environmental dangers; they act as transfer channels for pollutants to fresh and marine water. Because of the existing risks and the risks to come, a coordinated management and rehabilitation plan of polluted sites in the Arctic is essential to preserve the indigenous people and the environment. 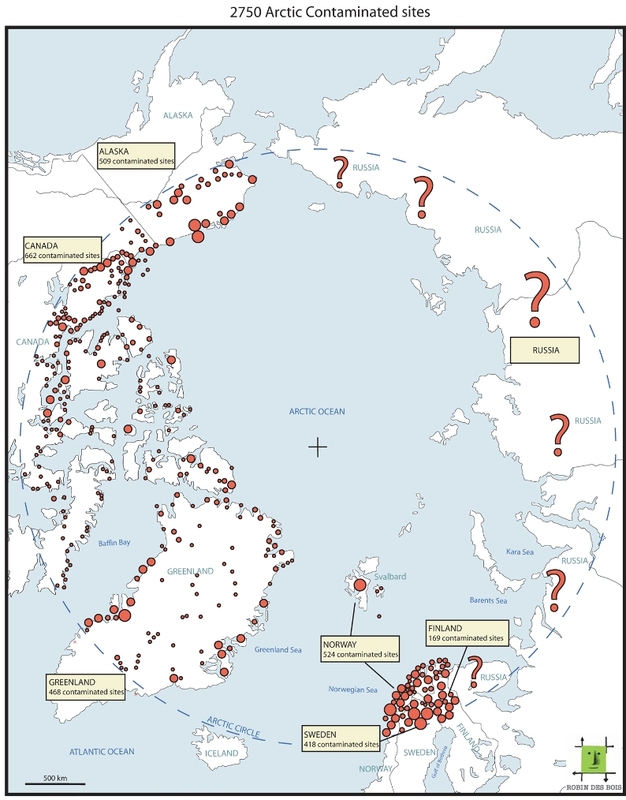 The maps of Robin des Bois’s inventory of Arctic contaminated sites synthesize the information provided by the countries that share the Arctic Circle (above 66.33 degrees north latitude). A contaminated site is signified by a red point. When the area has multiple polluted sites, it is indicated by points of different sizes in intervals of 2-10, 10 or more, and 50 or more. 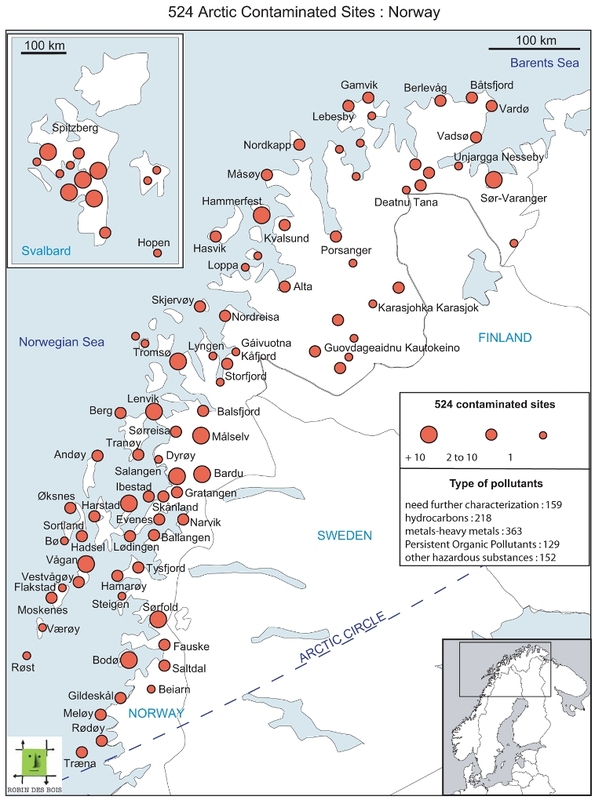 Each studied country– Canada, the United States (Alaska), Finland, Greenland, Norway, and Sweden – is the subject of an individual map of its polluted sites using the inventories provided by its administrative services and a summary of its principal known pollutants. The general map collects all the sites in the Arctic Circle and the known number of sites by country. No inventory was provided for the Russian territory in the Arctic Circle, thus it is marked with several question marks. An inventory devoted to Russia will be published later. Direct access : United States (Alaska), Canada, Greenland, Norway, Sweden, Finland, Russia. How to define a contaminated site in Alaska ? Contaminated Site (CS): a contaminated site is a location where hazardous substances, including petroleum products, have been improperly disposed. Many of these sites resulted from disposal methods considered standard practices before we became aware of the problems or hazards they can cause. Contaminated sites often threaten public health or the environment and can cause economic hardship to indigenous people and communities. Open: Contaminated sites which have been identified and have not yet been fully remediated or remediation has not yet commenced. Cleanup Complete: ADEC will give ‘Cleanup Complete’ status when efforts to reduce hazardous substance contamination have achieved the most stringent levels established in state regulation, or the possibility of human exposure to any residual contamination is highly unlikely. The Department may allow hazardous substances to remain in the environment at a site if the contamination does not pose a risk to human health or the environment, but there may be conditions or restrictions associated with the site that require compliance by current or future owners/operators. Those conditions or restrictions require follow-up reporting; the department would then grant a ‘Cleanup Complete – Institutional Controls’ status. Institutional Controls (IC): ADEC may establish conditions on a site to protect people and the environment from exposure to oil and hazardous substances during the cleanup process. This process may spend for a number of years. Conditions may also be set when contaminants remain after cleanup is completed to the extent practical or possible. Each of these conditions is called an Institutional control (IC). IC types and requirements are based on the potential for exposure, the concentration of contaminant(s), and the volume of impacted soil, groundwater or other media. The type(s) of controls correspond with the risk of exposure – more severe conditions are required for higher risk sites. High risk site IC types include servitudes, conservation easements, and compliance orders. Lower risk sites may have public informational IC types, including deed notices, ADEC online database notations, and letters to the landowner. Most ICs will have use restrictions and possible monitoring requirements, and these may include soil or groundwater monitoring, groundwater use restrictions, air quality monitoring, maintenance of engineering controls like fencing or asphalt caps, and soil and groundwater removal restrictions. Decisions about the need for ICs are specific to the conditions at each site. 144 with a status of “Cleanup Complete”. This inventory is a first decisive step, but procedures for rehabilitating the site when existent lack specific actions. These procedures consist, in the case of sites polluted by hydrocarbons, for the most part in spreading evenly over the whole surface of the site, therefore diluting the hydrocarbon polluted material. This is to help facilitate the return of the site to its natural state. The use of bioremediation (the digestion of hydrocarbons by bacteria) slows when temperatures are cold. Some sites have been labelled “Cleanup Complete” and wait indefinitely such as that of South Barter Island Dump where 20,000 drums were left by the military. The ADEC assures that all the drums are empty and do not pose a threat to humans. The uncovered depot is within the Arctic National Wildlife Refuge. In addition the ground polluted by hydrocarbons at Prudhoe Bay is treated thermally causing atmospheric dispersion of persistent pollutants and a reutilization of land considered to be no longer polluted. The rehabilitation programs can be summarized as cleaning the surface by regrouping rubble and keeping the contaminated equipment provisionally away from weather conditions by what are supposed to be waterproof covers. – The petroleum industry. In this inventory the petroleum industry includes oil exploration, exploitation, transportation, and distribution. Service stations and oil pipeline accidents are also considered in this distribution. – Military Activities. This includes military bases, DEW and WACS sites (see glossary), and shooting and manoeuvre ranges. – Civil Aircraft and Airports. The factors for pollution include airplane wrecks, some tanks for fuelling purposes, antifreeze, de-icing compounds and their associated discharges. – Mining sites make up a small number of the sites but can take up a significant area of land. Red Dog Mine is the US’s largest toxic polluter, releasing lead, mercury, zinc, copper, and other heavy metals into the land, air, and water. It covers an area of 120 miles². The mine specializes in lead and zinc. It is a joint venture between the Northwest Alaska Native Association Regional Corporation (NANA), Teck Cominco, and the Alaska Industrial Development and Export Authority. It is the largest zinc mine in the world. After the lead and zinc is extracted, it is transported 52 miles on an exclusive road to the nearest port. The road winds through the Cape Krusenstern National Monument, a protected land that harbors fish, birds, and other wildlife. The port is only functional for 100 ice-free days. Mine waste (deads) is dumped in nearby creeks, and dust particles from the transportation of the lead and zinc contaminate the area, particularly by the haul road. Deposits of dust are contaminating trophic webs. The area is inhabited by three local villages. The villagers live principally on subsistence, harvesting the surrounding land for food and water. This leaves them particularly vulnerable to the toxic dust. Along the haul road toxicity exceeds the Maximum Contaminant Level, even 1,600 meters from the road. Villagers have expressed concern over discharges from the mine causing water problems and depleting fish populations and have filed a complaint using the Clean Water Act. Studies have found that no amount of lead is safe in the human body. Red Dog Mine risks the safety of all of its inhabitants. More studies are needed to know the full extent of the risk. 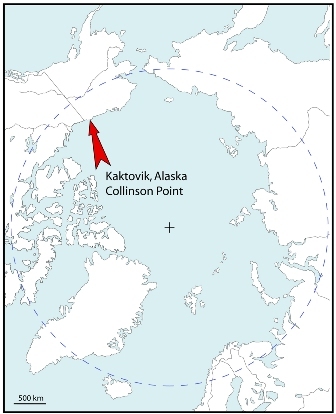 The Collinson point DEW site was part of the original 456-acre Brownlow Point DEW (Distant Early Warning) Line Station created by the Air Force as a radar system. It is no longer in use and is being cleaned up. The surface buildings were demolished in 2000. They contained asbestos, lead based paints, transformers, and dozens of drums. The rubble and waste were collected and put in a basin. The sediments were polluted by PCBs, hydrocarbons, heavy metals, and products used in the treatment of wood. Shoreline erosion can facilitate the spread of pollutants and the proximity to the Beaufort Sea means an increased amount of risk contamination for the marine resources. In 2006, a leaking pipe spread over 250,000 gallons of oil over an environmentally sensitive area. The leak was discovered by a worker, and repaired. The 2006 leaking pipe is the area’s largest in quantity to date. BP, who owns the pipe, found the pipe was corroded more than average. 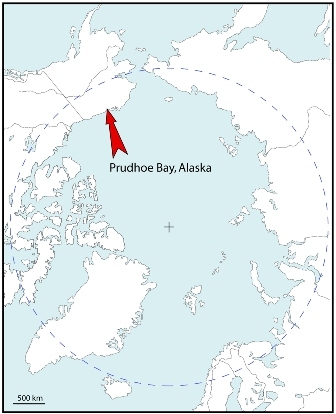 The leak is located on Prudhoe Bay. 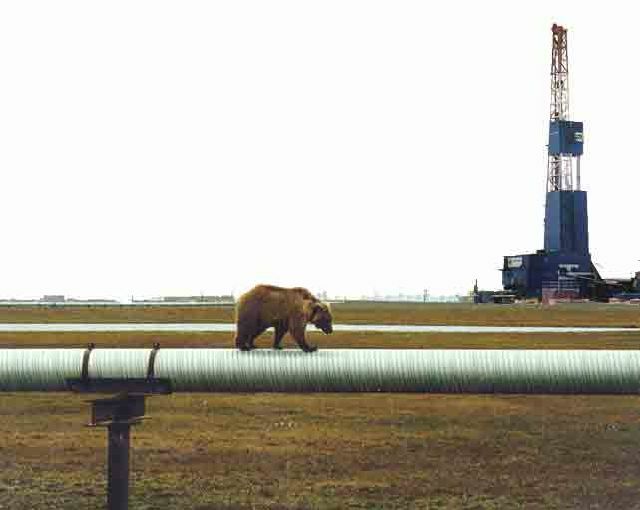 Prudhoe Bay is the largest oil field in the United States. It lies next to the Beaufort Sea. Most of the wells and pipelines are owned by BP and Phillips (formerly ARCO) but five other oil companies also have a stake. It produces about one million gallons of oil per day. Spills and pipeline bursts happen frequently Lloyd’s List reports another BP pipe leak on November 30th, 2009. The area is particularly sensitive to pollution because many caribou herds use it when they migrate and it is on the sea causing pollution to easily spread. The total damage to the environment and to local caribou herds is unknown. 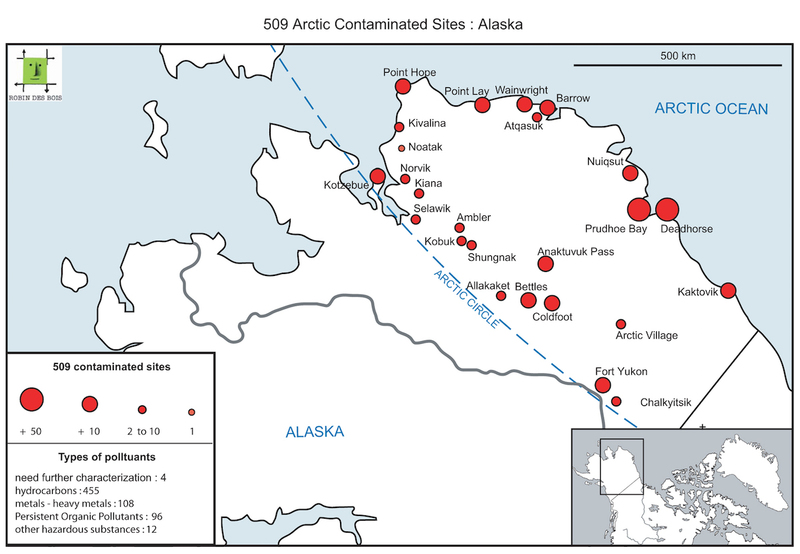 The complete inventory of contaminated sites within the Arctic circle in Alaska and their known characteristics are in the attached document (pdf 141 p., 383 ko). Contaminated Sites Program by the Alaskan Department of Environmental Conservation (ADEC), last updated in June 2009, provided the information used in our inventory; it is the most informative inventory of all countries studied. For further information please consult the above internet site to obtain a file on each site listed. AST: Aboveground Storage Tank. An aboveground storage tank or aboveground storage tank system means one or more devices, including any connected piping, designed to contain an accumulation of petroleum or other liquid or gorgeous materiel, of which the volume, including the volume of underground pipes, is 90% or more above the surface of the grade. Avgas: Avgas is gasoline fuel for reciprocating piston engine aircraft and is not to be confused with jet fuel. As with all gasolines, avgas is very volatile. BPCs: Biphenyl PolyChlorinated. In the United States they were commercialised as Therminol. They are Persistent Organic Pollutant, probably cancerogenic. They were used in Arctic as lubricant, additives in drilling fluid and in electrical equipments. They emit dioxins when burning. DNAPL: Dense Non-aqueous Phase liquid. A contaminant that is insoluble or has low solubility is heavier than water and sinks to the bottom of an aquifer and potentially through the underlying materials. Examples are solvents such as PERC, and TCE. 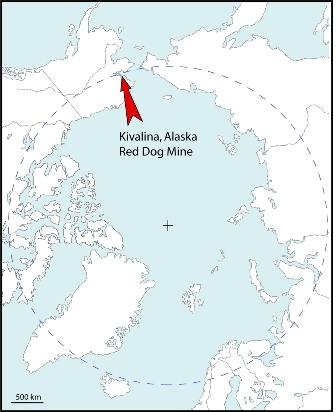 DEW Line, Distant Early Warning sites: During the Cold War (late 1940s to the late 1980s) a network of radar and communications facilities was constructed around Alaska. Distant Early Warning (DEW) Line stations were built as the primary line of air defence warning in case of an “over the Pole” invasion of the North American continent. 58 sites were constructed between 1955 and 1957. (See also White Alice Communication System). All the DEW Line stations have to be considered as potentially dangerous for the indigenous people and the environment. Gamme de carburants diesel utilisée en Arctique et contenant des additifs anti-gel. Dump: intentional accumulation of discarded containers, ammunitions, other specific wastes or by products of mining activities like deads. Dumps can occur at land, at sea or at surface water. ETM: Exposure Tracking Model. DEC’s Contaminated Sites Program developed the ETM as a flexible tool to rank sites at any stage of the cleanup process, to prioritize which sites need the most attention and to track progress. 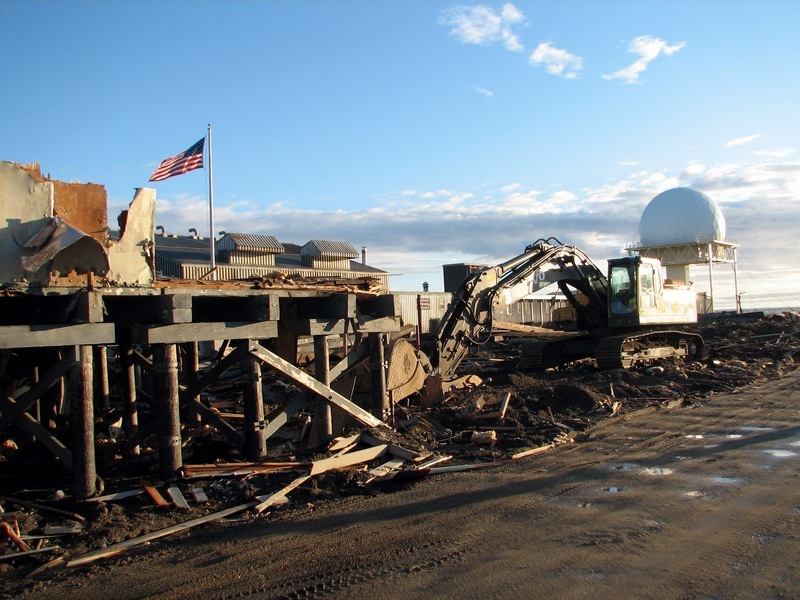 The ETM is a revision to the Alaska Hazard Ranking Model (AHRM), used previously to conduct a preliminary evaluation, and rank and prioritize all contaminated sites. The Contaminated Sites Program uses the ETM to conduct a preliminary evaluation on all sites and rank each site according to possibility of human and ecosystem exposure to the contaminants that are present. Progress at sites can then be tracked over time so that the prioritization can be updated as assessment and cleanup work is completed. The AHRM was intended to be a one time ranking model, and reprioritization was difficult with this model. The ETM is an internal tool put into place in the spring of 2007. DEC continues to transition between the two ranking models. Free product: any visible petroleum product (other than sheen) present as a separate phase on or in the ground water. IRP: Installation Restoration Program. A federal program designed to clean up contamination associated with Department of Defense facilities. It includes identification, investigation, and cleanup of hazardous substances, pollutants, and contaminants as defined by the federal cleanup law CERCLA; DoD-unique materials; and petroleum/oil/lubricants contamination at operating and closing/realigning installations (including off-installation areas to which contamination has migrated) and at Formerly Used Defense Sites. P-5 JP-5, or JP5 (for “Jet Propellant”) are jet fuels. POL: Petroleum, Oil and Lubricants. A common acronym used to describe the contents of tanks and associated piping that contains these materials. It also refers to a Dept. of Defense program to clean up petroleum spills or leaks. PAHs: Polycyclic aromatic hydrocarbons. A group of compounds composed of two or more fused aromatic rings. PAHs are introduced into the environment through leakages and the combustion process (i.e. forest fire, automobile exhaust, and fossil fuel power plants). Some PAHs cause cancer. TCE: Trichloroethylene is a non-flammable, colourless liquid with a somewhat sweet odour and a sweet, burning taste. It is used mainly as a solvent to remove grease from metal parts, but it is also an ingredient in adhesives, paint removers, typewriter correction fluids, and spot removers. Trichloroethylene is not thought to occur naturally in the environment. However, it has been found in underground water sources and many surface waters as a result of the manufacture, use, and disposal of this chlorinated solvent. VOC: Volatile Organic Compound. An organic (carbon-containing) compound that evaporates. Waste Accumulation: It is an other word for landfill and dump. WACS: The White Alice Communication System (WACS) sites relayed signals from Distant Early Warning (DEW line) defence communication sites to combat centres of the Alaskan air command. The White Alice sites used an over-the-horizon communications system throughout Alaska from about 1956 until 1979. The stations wove a telephone and telegraph network by bouncing both civilian and military communications signals off the earth’s troposphere, enabling combat centres to receive reports of aircraft detected by the Distant Early Warning Line. The system was designed by AT&T and built by the Western Electric Company, and took 3,500 people three years to complete. Ultimately there were 49 sites. Contaminated Sites Program. DEC. June 2009. O’Brien, Matthew. Alaska Natives And Environmentalists Battle Injustice at Red Dog. Vermont Journal of the Environment. November 13, 2001. Red Dog and Subsistence. Alaska Community Action on Toxics. May 2004. Anchorage, USA. A Pipe Problem. New York Times. 9 August 2006. Gumbel, Andrew. Burst Oil Pipeline Causes ‘Catasrophe’ in Alaska. 14 March 2006. Los Angeles, USA. Proposed Plan for Three ERP Sites at Barter Island. United States Air Force. 15 May 2008. Prudhoe Bay. CH2MHILL Polar Services. Spill Prevention and Response. Department of Environmental Conservation. EPA List of Hazardous Wastes from Non-Specific Sources. MIT. Hastings Ground Water Contamination. Weitz and Luxenberg. ToxFAQs for Total Petroleum Hydrocarbons. Agency for Toxic Substances and Diseaese Registry. August 1999. Carol Ann Woody. Fisheries Research and Consulting. 2 April 2008. Ailsa Allaby and Michael Allaby. Thermokarst. Encyclopedia.com. 1999. USA. Health Consultation, Agency for Toxic Substances and Disease Registry. Dennis M. Filler, Ian Snape, David L. Barnes. 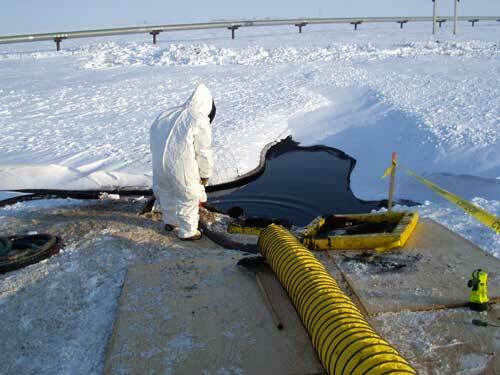 Bioremediation of Petroleum Hydrocarbons in Cold Regions. Cambridge University Press. Cambridge, 2008. Gary Hoefs. What is Prudhoe Bay University of Minnesota, Duluth. Collinson Point DEW Station. Artists of the Arctic Refuge. How to define a contaminated site in Canada ? Contaminated Site: According to the definition adopted by the government of Canada, a contaminated site is “one at which substances occur at concentrations (1) above background (normally occurring) levels and pose or are likely to pose an immediate or long term hazard to human health or the environment, or (2) exceeding levels specified in policies and regulations.” In other words, the main qualification for including a site in the inventory is that there is a concentration of a substance in the soil or ground water (usually a petroleum product or a metal) that is higher than expected for that region of Canada. There must also be some evidence that this concentration poses a risk to human health or the environment. This risk is determined in a step-by-step process, beginning with a rough estimate of the contamination based on guidelines agreed to by federal, provincial and territorial environment ministers, all of whom are members of the Canadian Council of Ministers of the Environment (CCME). The final stage in the procedure process is an Environmental Site Assessment that uses such tools as field sampling and laboratory analysis to determine the type and level of contamination present. 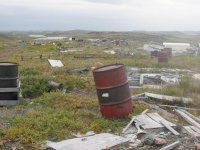 Much of Canada’s polluted sites above the Arctic Circle are undocumented. 69% of the sites presented in the document have not been assessed. Roberts and Ida Silver Mines were used for over 30 years. The two sites are filled with mine openings, wastes, litter and the surrounding soil is contaminated with hydrocarbons and metals. 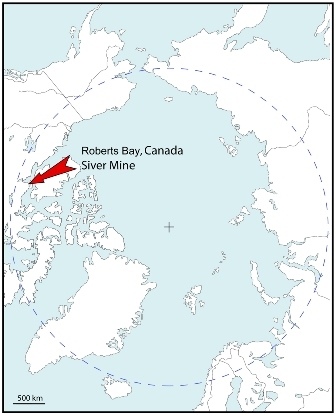 The Ida Silver Mine is 5 km away from Roberts Lake, increasing the risk of pollution spread. Water samples showed raised levels of both Selenium and Zinc. Bottom dwelling fish are particularly at risk because the marine soil has been impacted. Plans are currently in place to clean the site. Once clean up is complete, there will be monitoring of the area for 25 years. Originally a radar station, this site on Broughton Island is currently out of use. There are still radioactive sources and PCBs in the soil and decrepit buildings. Broughton Island is known for its biodiversity. Because of its location close to the Sea, old fuel tanks and landfill remains could threaten marine species in the Arctic Sea including right whales, beluga whales, narwhals, walruses, and orcas. Plans are currently in place to clean the site. Once clean up is complete, there will be monitoring of the area for 25 years. Mould Bay Abandoned Weather Station. Built in the 1940s, the Mould Bay weather station was abandoned in 1997. No remediation was completed upon leaving the site and since then, nothing has been done to remediate the area. The complex is now an incubator for dangerous moulds. In addition, the site contains old fuel drums, old trucks, snowmobiles, and a runway for aircraft. It is considered a hazard for humans. It is nicknamed the “toxic ghost town”. The whole area is broken up into 14 contaminated sites. It will likely cost tens of millions to clean up. Several times, money has been appropriated for remedial projects for the site, but taken away before action was taken. 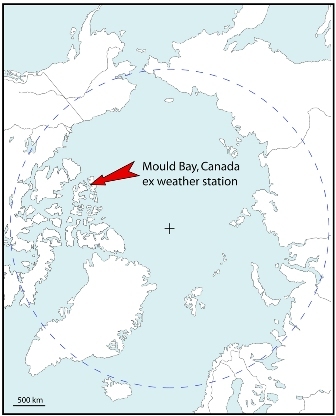 Mould Bay is a key stepping stone to the Northwest Passage, and some speculate it may be refurbished to create a world-class high Arctic research center. The Canadian doctrine on pollution is pioneering. 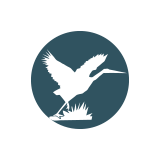 In 1916, the bilateral treaty called the Migratory Birds Act made it illegal to dispose of hydrocarbons or other hazardous substances in Canadian territories in order to protect migratory birds. The national program for cleaning up contaminated sites was launched in 1989 by the CCME. This program is constantly evolving; it is financed federally, provincially, and territorially. 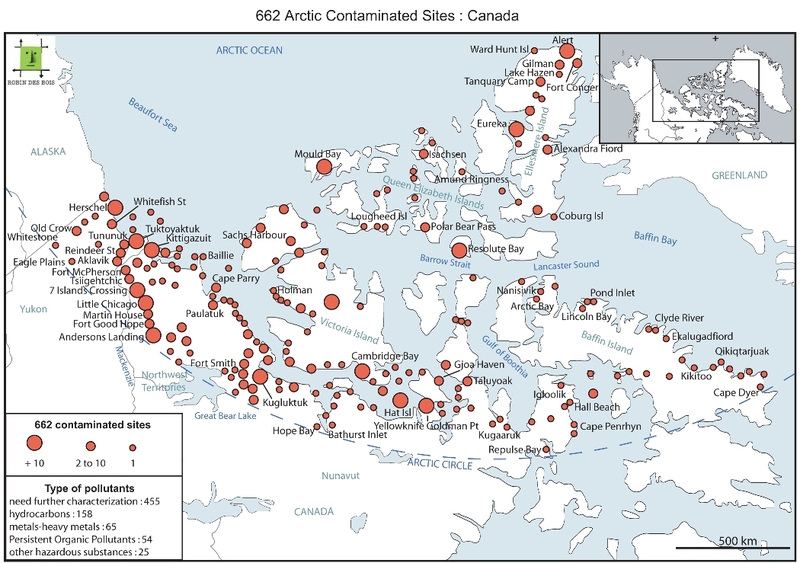 Other than military sites, most polluted sites inside Canada’s Arctic Circle are from the mining industry whose by-products are slag and acidic waters containing metallic pollutants. However, with the information given it was difficult to pinpoint the exact contaminated mining sites in the Northwest Territories and Nunavut. The complete inventory of contaminated sites within the Arctic Circle in Canada and their known characteristics are in the attached document (pdf, 104 p. 190 ko). Robin des Bois used the Canadian Federal Contaminated Sites Inventory (FCSI) to complete the inventory. Information is constantly updated. In Canada contaminated sites are gathered using the Federal Contaminated Sites Action Plan (FCSAP) Classification System. Roberts and Ida Bay Silver Mine Remediation Project. Indian and Northern Affairs Canada. Vijay Lanji, Ron Besel, Stewart Dafoe, Scott Pasin, Chris Veenstra. Fox 5 Dew Line Site, Nunuvat. Hazco. Margaret Munro. Arctic Research Station A ‘Toxic Ghost Town’ Canwest News Service. http://easweb.eas.ualberta.ca/download/file/papers/paper_75.pdf. 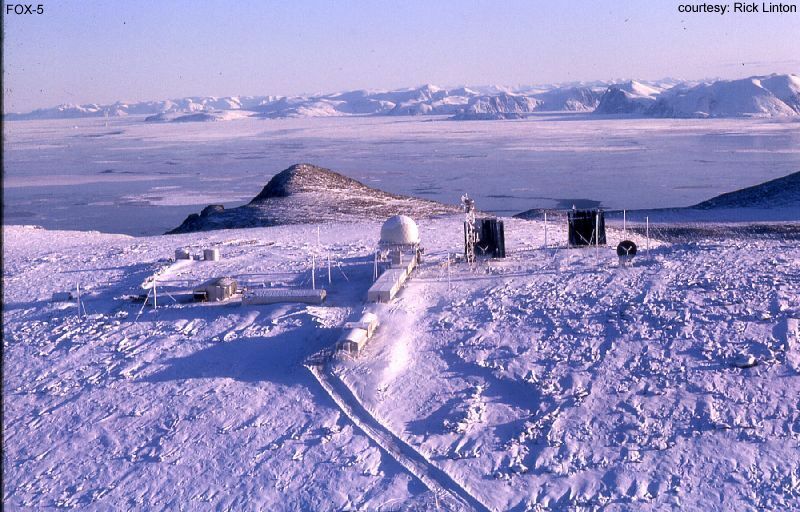 Deserted Arctic Weather Station is a Mess. Arctic Herald. 24 May 2009. How to define a contaminated site in Greenland ? 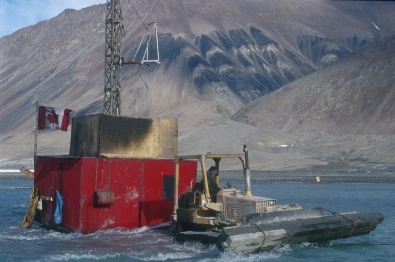 Greenland’s inventory of polluted sites is not exhaustive, notably on the subject of contamination and radioactive risks concerning the Thule base. Till now the purpose of the Greenland inventory is to map all human activities likely to have polluted soils and water. The largest providers of Greenland polluted sites are scientific stations and laboratories accounting for 145 of the 468 sites. These are often owned by Danish or American universities. Landfills and dumps account for 48 of the polluted sites. Oil and petroleum account for 37 of the sites. This includes oil exploration, exploitation, transportation, and distribution. Service stations and oil accidents are also considered in this distribution. Military sites account for 36 of the sites. Many of these are Sirius sites, but many are also from the United States military and other arms of the Danish military. Airplane accidents, both military and civilian, account for 22 of the sites. 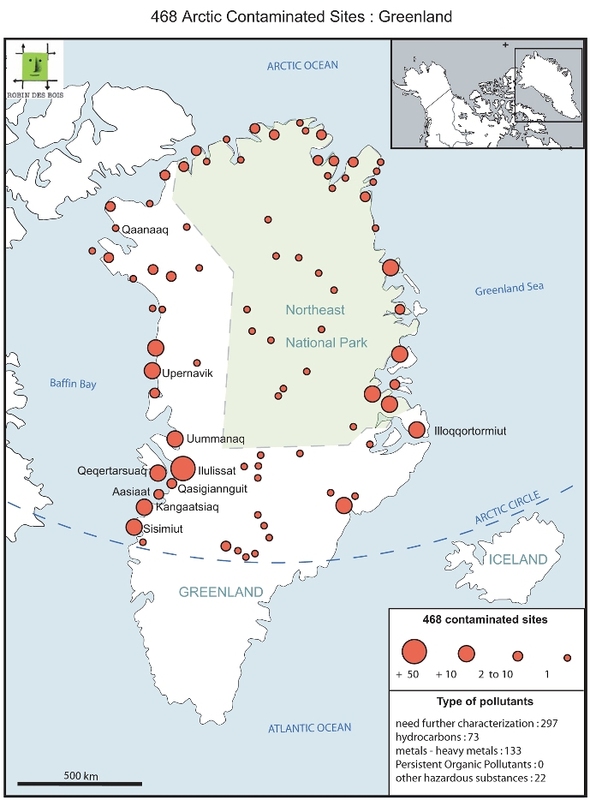 Mines also pollute Greenland accounting for 19 of the 468 sites. Some other activities causing pollution include power plants and civil aircraft with their usual pollutions such as fire drill, hydrocarbons leakage, asbestos in the buildings. This zinc and lead veins were discovered in the 90s. Developers have begun searching the area for an upcoming mine site. 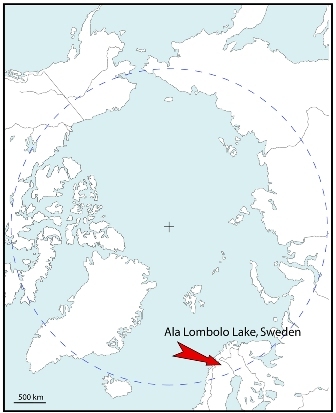 The development projects are already threatening the nearby fjord. 34 kilometers of drilling have been done in 143 holes all in the largest national preserve in the world, the Northeast Greenland National Park. These drilling operations have already polluted soils. 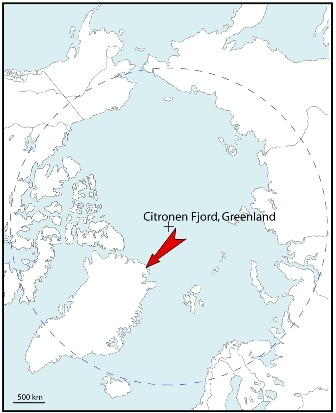 Consequently, this development project is yet listed in the Greenland inventory. The huts listed in the inventory belong mostly to Sirius. Sirius is a Danish military department which was dedicated to the survey of the area. Sirius patrols were mainly traveling by dog sledge. The largest hut is at Daneborg, with 12 permanent residents. Huts are potential polluted sites because they use PCBs transformers, anti freeze, fuel generators, batteries and other technical equipments. In the Greenland inventory many landfills are associated to the huts. In addition, some of these huts have been built on former mining sites of which the levels of pollution are unknown. 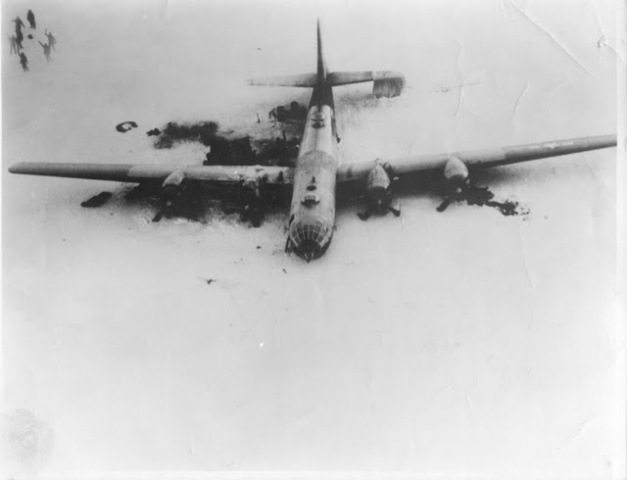 The Kee Bird was a B-29 aircraft forced to land in 250 miles north of Thule, Greenland in February 1947. Its crew was saved but the plane was abandoned. Later, due to the value of a B-29 plane, Darryl Greenamyer decided to try to reclaim the plane. He sent a crew to repair and get the plane back into the air. After over a month of repairs in the harsh Arctic climate, the plane was ready to lift off. However, the plane lit up in flames as it was lifting off, melting and partially sinking into the lake the group decided to use as a runway. The crew survived but the aircraft was irretrievable. The following summer, when the rest of the ice in the lake thawed, the plane sunk into the lake. All of the fuel, hydraulics, and other chemicals the plane contained, as well as the wreckage, spread into the sensitive environment. Even small amounts of fuel pollution can kill animals and plant life. There are no plans for the future removal of the aircraft. 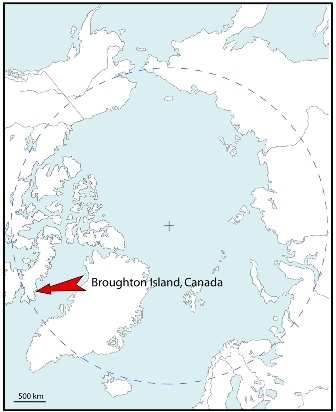 The DEW line was built during the cold war by the United States for protection against an “over the pole” attack. Now, the leftover sites are often abandoned. They often include waste, PCBs from transformers, and abandoned infrastructure. 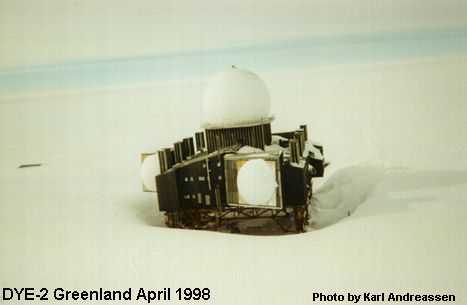 There are four DEW line stations in Greenland and one warning station. (see also Canada and Alaska). Greenland is the only state whose territory is mainly within the Arctic Circle. Greenland covers 2,186,000 km² and has a population of 57,000 inhabitants. The extent and characterization of pollution left by former American military bases has not been attained. 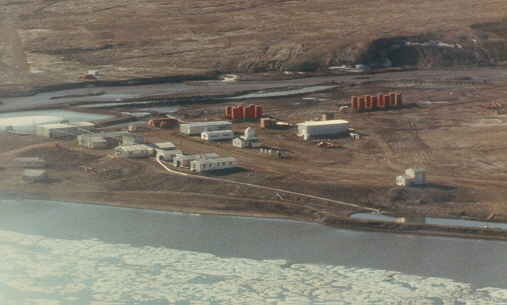 Historic and generic wastes from former military bases, scientific, and meteorological sites in the Arctic environment include food packaging and hygiene products and their residue. These wastes were collected in dumps or burned in incinerators that heavily pollute the soil in the immediate perimeter with acids, dioxins, and heavy metals. Sanitary waste undergoes the same treatment. Urine and excrements are discharged in holes or stored in drums and tanks, collected, then abandoned. Old ammunitions or residue of ammunitions undergo the same treatment as mechanical and electronic waste such as batteries, storage batteries, and electrical equipment contaminated by PCBs. The underground and above ground tanks used for storing fuel and its pipes have yet to be purged. The direct effect of this deplorable management of waste is contamination to wildlife – birds, mammals, and fish – through the introduction of invasive micro-organisms and micro-pollutants. This negative impact is much heavier in the Arctic than the Antarctic where storage and utilization of military gear is not permitted and the environment is protected by a variety of agreed measures and binding agreements for the protection of wildlife and fauna which are listed in the annexes of the Antarctic Treaty. These protections do not exist for the Arctic. The complete inventory of the 468 contaminated sites within the Arctic Circle in Greenland and their known characteristics are in the attached document (pdf, 37 p., 80,6 ko). The information used was obtained from NunaGIS, a digital atlas displaying maps of Greenland by Asiaq who used data provided by the DMU (National Environmental Research Institute). For further information please consult the below link. As Greenland is currently undergoing a reshuffling of their municipalities it is difficult to obtain further information, certain official’s informed Robin des Bois of the presence of contaminated sites which are not yet listed in the official registry. ASIAQ: Asiaq is a public enterprise under the Government of Greenland which operates all over Greenland, undertaking activities concerning the physical environment. Asiaq’s responsibilities include; mapping, geographic information, hydrology, climate, environment, and surveying and geotechnical investigation. CASP: CASP is a not-for-profit charitable trust carrying out field, literature and analysis-based geological research in prospective hydrocarbon basins. Funding comes entirely from subscriptions by the oil and gas industry. DMI (Danish Meteorological Institute): DMI has provided meteorological information for 135 years and its warning and forecasting duties reach well beyond the Danish border including the oceans and Greenland. NANOK: The North-East Greenland Company NANOK is a private, non-profit organisation founded in 1992 upon the former East Greenland Trapping Company NANOK Ltd., founded in 1929. Today the aim of NANOK is to disseminate knowledge of North-East Greenland and its culture history and to contribute in securing the cultural monuments and buildings in the area. Palle Norrit. The Sirius Sledge Patrol. Eastgreenland. The DEW Line Sites in Canada, Alaska, and Greenland. Air Defense Radar Museum. Zinc in North Greenland. National Environmental Research Institute. 30 September 2009. The Dog Sledge Patrol Sirius. Lille Nedergaard. Malcolm W. Browne. Ice Cap Shows Ancient Mines Polluted the Globe. New York Times. 9 December 1997. 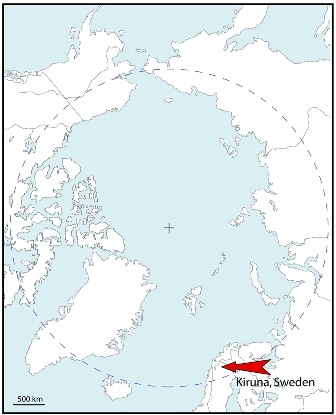 Alcoa Divides and Rules Greenland. Saving Iceland. 11 January 2008. Special Deals for Alcoa Aluminum Texas’ Largest Grandfathered Polluter. Toxic Texas. Katharine Fink. Alcoa May Create Aluminum Industry in Greenland. DUQ. 13 May 2008. Uffe Storm Boe. Activity and Identifying Waste in the Open Country. October 2003. Nuuk. Wayland Mayo. B-29 Frozen for 50 Years. Contributed Short Stories. The Last Flight of the B-29 Kee Bird. MechDir. The B-29 Kee Bird, Abandoned plane, near Thule, Greenland. Artificialowl. How to define a contaminated site in Norway? Polluted soil: the soil or rock where the concentration for health of environmentally hazardous substances exceed the established standard values for the polluted soil, or when other health-and environmentally hazardous substances have been detected after a risk assessment. If the concentration of inorganic health or environmentally hazardous substances does not exceed the local natural background levels in the area where a ground intervention is planned to take place, it should not be considered polluted. Things that form acid or other substances that can cause pollution in contact with water and / or air, are considered to be contaminated. The largest polluter in Norway by activity is Landfills and Dumps. This includes general landfills and more specialized dumps found next to mines and other industries and causes many different types of pollution. Landfills and Dumps account for 305 of the 524 total sites. Ship Construction also accounts for a large number of the polluted sites. Ship construction often involves waterproofing and preservation materials that harm the environment. 41 sites in Norway were contaminated by ship construction. Some other activities causing pollution include the automotive industry, civil aircraft, the military, mining, oil and petrol industry, and power plants. 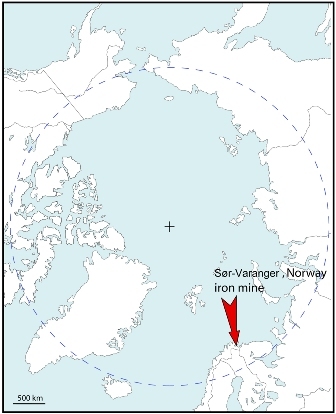 Sør Varanger Iron Mine was opened in 1906. Since then, it has been destroying the nearby fjords and endangering the surrounding habitats. Closing ten years ago, only to be reopening in 2010 the company has now asked for an increase in the amount of waste it can release into the fjord. It claims it needs to dump more waste to improve the quality of the iron as quality iron demands have increased in the current economic climate. The pollution is likely to have a devastating effect on local marine life. PCBs have long been noted in Svalbard. Some PCBs originate from atmospheric and water currents, however most are believed to come from local landfills, used in the mining industry, and in electrical equipment particularly used for international scientific stations. PCBs are not soluble in water, but are persistent. PCBs are dangerous for the ecosystem because they bioaccumulate in organisms. This means that organisms higher up in the food chain, like humans, are more at risk. Even in small amounts, PCBs are toxic as they disrupt the immune system and are probably cancer causing. In humans, they are known to cause growth deficiencies. Many species of animals have tested positively for PCBs in the area including seals, whales, polar bears, and sea birds. In May 2009, the Stockholm Convention on Persistent Organic Pollutants (POPs) included nine new substances. The Stockholm Convention lists the most dangerous pesticides and industrial chemicals that can kill people, cause cancer and reproductive disorders, and interfere with normal development. These new chemicals included Perfluorooctane sulfonic acid, its salts and perfluorooctane sulfonyl fluoride, or Light Water AFFF, they are listed under Annex B of the Convention. Light Water AFFF is a toxic which is used in fire fighting foam. It is a problem throughout Norway but particularly in military airport sites and oil rigs. In October 2005, two oil rigs were found to be dumping the toxic directly into the North Sea. The ill effects of Light Water AFFF have been known since 2000, yet it is still used worldwide in large industrial facilities, oil refineries, and airports. All the fire fighting products and the fire drill areas generate potentially contaminated sites particularly next to airports. Stone Age rock sites are not listed in the Norwegian inventory of contaminated sites but they deserve a few words. 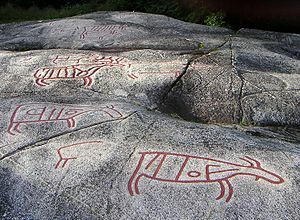 Norway’s Alta province is filled with rock carvings. Some are over 6,000 years old. They were rediscovered in the 1970’s. Since then, pollutants have been threatening to ruin the carvings, especially air pollutants. Recently, however, a new pollutant threat has been discovered. The salt used to de-ice a nearby road has been proven to travel to the rocks and cause deterioration. It seeps into the nearby grass, endangering local vegetation. The rock carvings are a world heritage site and depict hunting, fishing, and the use of musical instruments. They may have also had religious significance. Scientists are currently looking to find the best way to protect the carvings from pollutants – especially those from de-icing. 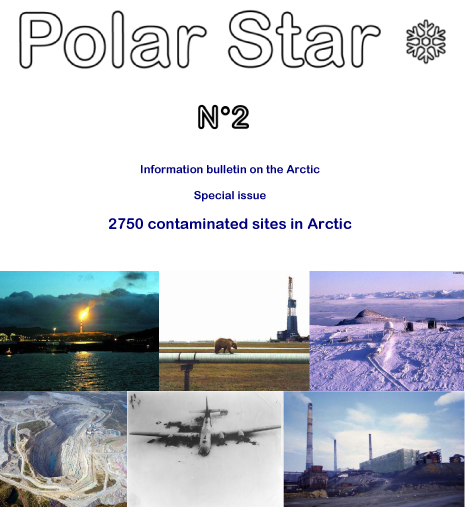 The complete inventory of the 524 contaminated sites within the Arctic Circle in Norway and their known characteristics are in the attached document (pdf, 77 p. 163 ko). BTEX: Benzene, Toluene, Ethylbenzene and Xylene. Organic chemicals found in fuels that evaporate quickly and can cause cancer. PAHs: Polycyclic aromatic hydrocarbons. A group of compounds composed of two or more fused aromatic rings. PAHs are introduced into the environment through the combustion process (i.e. forest fire, automobile exhaust, and fossil fuel power plants). Trine Hamran and Kjersti Sjursen Lien. Krever mer kunnskap. NRK. 9 April 2009. Increases Pollutions to Border Fjord. Barents Observer. 9 March 2009. 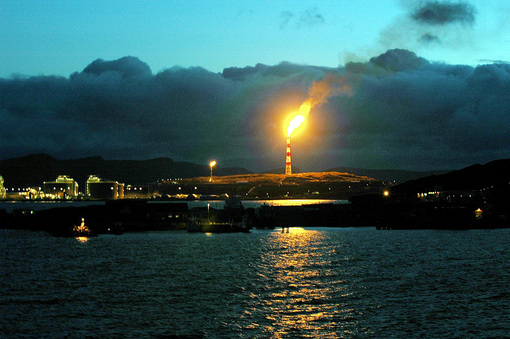 Norway : Exposed Oil Companies to Stop Using Toxic Pollutant. Friends of the Earth Norway. G. Aberg, H. Stray, and E. Dahlin. Impact of Pollution at a Stone Age Rock Site in Oslo, Norway, Studied using Lead and Strontium Isotopes. Science Direct. 11 May 1998. Pollution Threatens Prehistoric Carvings. BBC. 1 September 2000. The Greener Way to Deice Your Streets. The Restoration Resource. High Metal Prices Will Re-Open Mine. 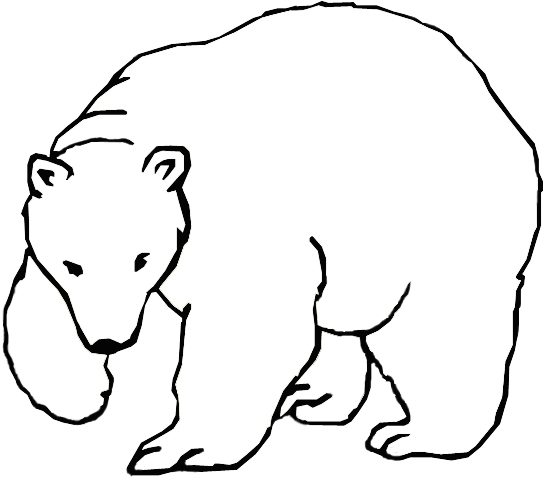 SIKU News. 11 December 2007. Forskrift om endring i forskrift om begrensning av forurensning. Lovdata. 1 July 2009. Governments Unite to Step-up Reduction on Global DDT reliance and add nine new chemicals under international Treaty. 9 May 2009. Geneva. State of the Environment Norway. Halvard R. Pederson. 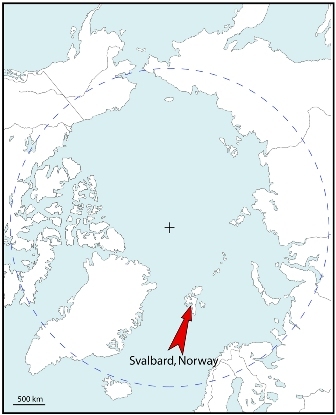 Svalbard Free of Local PCB Sources. Ministry of the Environment. 15 November 2008. PCBs in Svalbard. Department of Environmental Affairs April 2008. Svalbard. Cultural Heritage Management. Directorate for Cultural Heritage. Oslo, Norway. Svalbard Midway of Europe and North Pole. Best place to visit around the world. 22 March 2009. Scientific Facts on PCBs. Greenfacts. How to define a contaminated site in Sweden ? Contaminated site” refers to any land, groundwater or sediment containing concentrations of pollutants that are significantly elevated above background levels due to local emissions. The assessment criteria presented here are intended as an aid in classifying the health and environmental hazards associated with contaminated sites by means of the MIFO method. The lower the number on the 4 point scale, the higher the environmental hazard, making 1 the highest and 4 the lowest. The largest polluter is the oil and petroleum industry with 75 of the total 418 sites. This includes oil exploration, exploitation, transportation, and distribution. Service stations and oil pipeline accidents are also considered in this distribution. The mining industry is next with 69 sites. Mines cause surrounding heavy metal pollutions on land and in water. They are also responsible for dust pollution and erosion. The automotive industry is another heavy polluter with 53 sites. This includes automobile scrap yards, garages, and repair shops that often pollute their surroundings with hydrocarbons and other toxic fluids. Landfills and Dumps account for 52 sites. These may be residential or industrial or mixed and may contain many different types of pollutants. Other activities causing pollution include civil aircraft, civil shooting ranges, and the military. 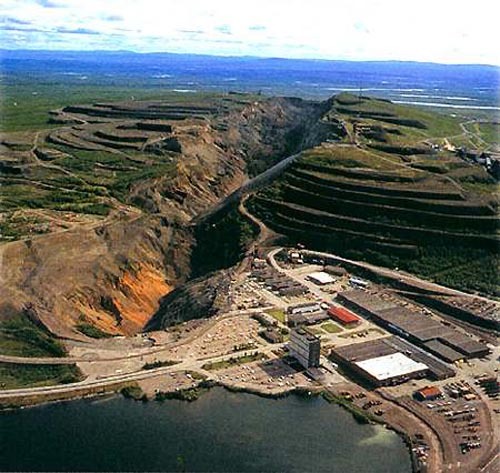 Kiruna is a small mining town in northern Sweden. It has about 24,000 inhabitants. It is currently the world’s largest iron mine. The mine delves nearly a kilometer underneath the ground. Originally built to be an ‘ideal society’ Kiruna is now being consumed by its chief employer. The iron mine owned by LKAB that created the town is now destroying it. The center of the town is sinking, forcing it to relocate completely. The town hall will be split into six pieces and moved. The houses on the area will be loaded on large trailers and moved. In addition to the sinking landscape, the land directly surrounding the mine is polluted with, traces of zinc, copper, nickel , and lead, cadmium arsenic, and mercury which are very toxic to humans. Ala Lombolo is a lake in Northern Sweden. It is poisoned by 200kg of mercury from the surrounding industries, particularly a lab and dental clinic. In addition, the armed forces dumped ammunition into the lake in the 1950s. 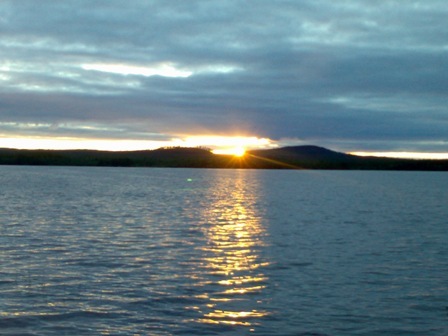 It is currently Norrbotten’s most heavily polluted lake. Sediments contain mercury, which even in small amounts, cripple ecosystems, particularly closed aquatic ecosystems. Possible restoration projects are being investigated but the extent of the pollution makes remediation difficult. 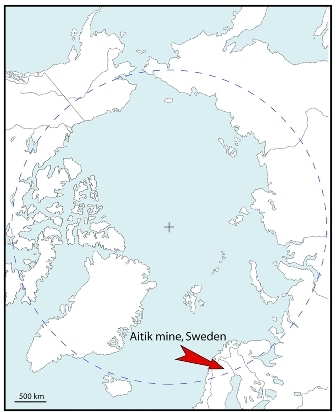 The Aitik mine is Europe’s largest operating copper mine. The surrounding waters contain dissolved metals and a higher acidity than normal. Mining is dangerous to freshwater as the contaminants often leak into the surrounding groundwater. Thus, it not only threatens the nearby ecosystem but also the groundwater and all the inhabitants downstream. In addition, the weathering of the site has caused further increased contamination. The complete inventory of the 418 contaminated sites within the Arctic Circle in Sweden and their known characteristics are in the attached document (pdf, 74 p., 160 ko). The information used were collected from the County Administrative Board of Norrbottens Environmental Protection Division internet site. The information was taken from documents on each community as well as from documents specialising on certain industries. To have access to these documents please see the link below. Sweden informed Robin des Bois that they will produce a compiled inventory on contaminated sites in Sweden in 2012. 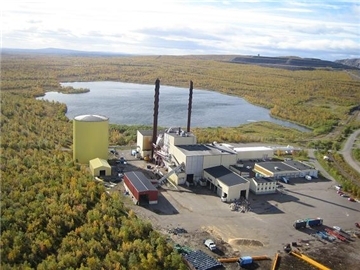 There is little information on the northern county of Kiruna as the Swedish authorities will be taking a closer look at the these sites from 2010-2011. A thesis titled “Inventory of Old Mining Waste in Norrbotten” written in 1993 was also used to for the documentation. All the documents used are listed in the sources section. BKL (BranschKLass): is short for “industrial branch survey”. 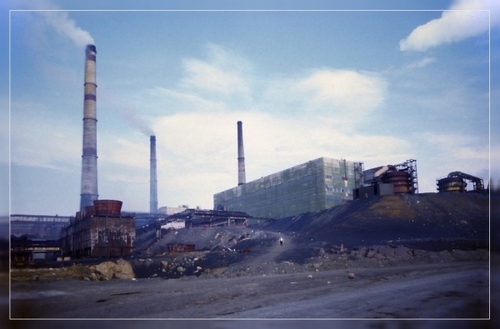 In the beginning of 1990 the Swedish Environmental Protection Agency did a survey of industrial branches, to estimate the specific remediation problems connected to each industrial branch. LKAB: Luossavaara-Kiirunavaara Aktiebolag). A Swedish Mine Company. It has been 100% state run since the 1950s. MIFO (Metodik för Inventering och Riskklassning ar Förorenada Områden) : is a tool for inventorying contaminated sites and assigning them to hazard classes. Health and environmental hazards at a contaminated site are determined by the hazardousness of the pollutants (depending on their chemical and physical properties), the pollutant levels (concentrations), their migration potential (depending on the nature of the soil and on groundwater movements), the sensitivity of the site (risk of human exposure) and its ecological value (natural conservation values in the neighbourhood). These factors are each classified on a four-point scale. MIFO phase 1 is a preliminary survey which results in a risk classification (1-4). The worst sites (risk classes 1-2) are then selected for MIFO phase 2 which is a preliminary site investigation. The data from field investigations will result in a new (MIFO2) risk classification. Sweden to Save ‘Sinking’ Town. BBC News. 29 September 2004. Stig Johansson. Projekt Ala Lombolo. Kiruna Kommun. 6 February 2006. Lars D. Hylander, Anders Lindvall, Lars Gahnberg. Dental Clinic’s Employment of Analgram Separators, Best Management Practices. Uppsala University. 25 May 2007. Kiruna: The Town that Moved. StrangeHarvest. 22 January 2007. Stig Johansson. Områdesbeskivning. Kiruna Kommun. 6 February 2009. Hubery Elming. Inventering Av Förorenade Områden I Jokkmokks Kommun (Inventory Of Contaminated Sites In Jokkmokk Municipality). December 2006. Laila Hedlund and Karin Forsgren. Inventering Av Förorenade Områden I Gällivare Kommun (Inventory Of Contaminated Areas Of Gällivare Kommun). December 2004. Anna Magnusson. Inventering av förorenade områden i överkalix kommun (inventory of contaminated sites in överkalix municipality). September 2003. Helena Skolglund. Inventering av förorenade områden i Norrbottens län enligt MIFO-modellen 2002 (Inventory of contaminated sites in Norrbotten under MIFO model 2002). Louise Larborn. Inventering Av Aldre Gruvavfall I Norrbotten. Lansstyrelsen I Norbottens Lan. 1993. Mats Aunes. Länsstyrelsen i Norrbottens län. Miljöskyddsenheten. Introduction to a method for inventories and risk classification of contaminated sites. Swedish Environmental Protection Agency. Stockholm. ToxFAQs for Arsenic. Agency for Toxic Substances and Disease Registry. August 2007. How to define a contaminated site in Finland ? Contaminated site: there is no straight definition in Finnish legislation. According to the soil pollution prohibition in the Environmental Protection Act (EPA), the contamination of soil is related to the effects, and not to the concentration of the harmful substances. This is in line with the proposed Soil Framework Directive (SFD). Restrictions to the use of the site : There are some restrictions to the use of the site according the site’s category, the status of the activity, the state of soil and the possible remediation action. Check the need for assessment: There is no need of immediate action. On operative sites the site survey is often necessary when activity ends, or the ownership, or the tenancy of the property changes, or if any harm occurs. On sites requiring assessment the site survey is often necessary in the case of land use change, building or sale or rental of the property or if any harm occurs. Soil use restriction: The actual land use is not restricted, but the use of excavated soil might be restricted. Land use restriction: The area is not suitable for sensitive land use e.g. residence. The excavation and treatment of the soil requires permit. If the land use in the area changes, the new assessment of the remediation need is necessary. No restrictions for use: The use of the area is unrestricted unless something new in the knowledge of the soil appears. 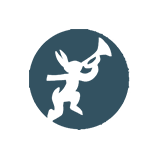 – Operative sites: Environmentally hazardous substances are handled or stored at the site. As soon as operations are concluded or altered the state of the soil shall be examined where necessary. -Sites requiring assessment: Such sites are known by the authorities to have been used for activities involving substances that can harm the environment, and that may also have entered the soil. Even if soils have not always been contaminated in such cases, it is important that such risks are considered when changes in use or building are planned, and also accounted for in the sale or rental of such properties. -Sites which must be investigated or remediated as necessary: In such sites, wastes or other substances are known to have reduced soil quality, creating potential health risks or damage to the environment. Such contamination may also reduce the amenity value of sites. -Sites where no remedial action is needed: Such areas include sites where soils have been cleaned up according to the authorities’ requirements, as well as sites where detailed surveys have shown that soils are not significantly contaminated. In some of these sites certain forms of land use and development may still be limited. There are 162 sites in 13 communities in the national inventory. Meanwhile, Robin des Bois finds it relevant to add 7 mines to the official inventory. Landfills and dumps account for the greatest number of contaminated sites by activity. Of 169 sites 112 are polluted by landfills and dumps. This includes general landfills as well as dumps for industries. Landfills and dumps contain many different types of pollutants. The oil and petrol industry accounts for 22 polluted sites. This includes oil exploration, exploitation, transportation, and distribution. Service stations and oil accidents are also considered in this distribution. Some other activities causing pollution include the automotive industry, civil aircraft, mining, and power plants. The major mining activities in Finland are gold, platinum, base metals, diamonds and other industrial minerals. Finland has a long history of mining activity and metals production. Iron-ore mining activities started in around 1540 and since then, about 270 metal mines have been in operation throughout Finland. Today open-pit gold mines are the most common; the surrounding flora and fauna are removed from the mined area and the ore is blasted and scooped out. 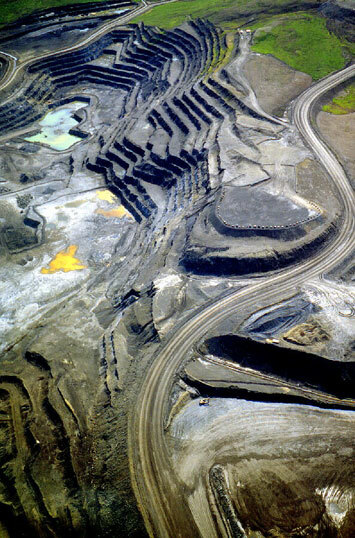 Open-pit mines produce on average up to 10 times more waste than underground mines. Mining using ammonium and nitrate in blasting pollutes surrounding water bodies. Gold mining is destructive to the vegetation and to the water resources which are extremely fragile in the Arctic areas. Hannukainen, in Kolari is a mined deposit exploited from 1978–1992 when 1.96 Mt iron, 40,000 t copper and 4300 kg gold were produced. Hanhimaa and Kettukuusikko are two gold mines near the town of Kittilä. Kaaresselka in Sodankylä is also a gold mine which is currently in exploration. Pahtavaara in Sodankylä is an open-pit gold mine located in the eastern part of the Central Lapland greenstone belt; its production started in 1996. 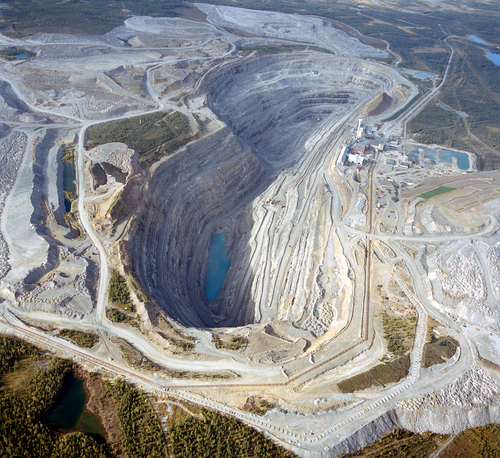 Pahtavuoma is a copper and zinc mine, situated in the western part of the Kittilae greenstone complex in Northern Finland. 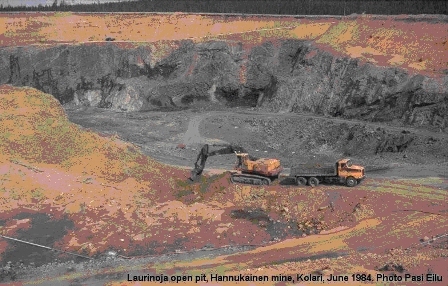 In 1971 radioactivity was detected in drill cores during exploration for copper ore.
Outokumpu’s Saattopora Mine in Kittilä produced gold and copper from 1988 to mid-1995 when the reserves were exhausted and the mine was closed. Pulju in Kittilä a nickel mine was owned by Outokumpu Mining Oy from 1977–2004. This complex was built by Finnish and Canadian companies and through its history has also been in German and Soviet hands. It is a nickel processing site. It pollutes the surrounding air with sulphates and heavy metals. The sulphates make the land more acidic which affects the growth of trees. It is nearby the Lapland forests, the geographically most northern forests in the world where growth is relatively slow. There is visible damage on the pine needles. While its pollution levels have gone down significantly since 1990, traces of the previous pollutants remain. The pollution was also found in nearby lakes. This is particularly dangerous for Finland as almost all Finnish drinking water comes from ground water sources and contamination from lake waters can seep into ground water over time. 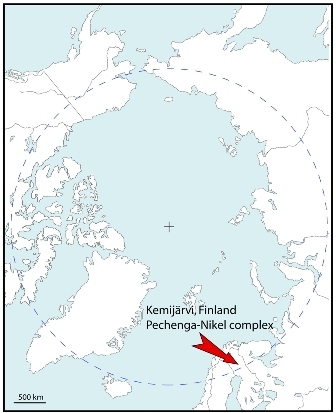 The Pechenga-Nikel complex is being monitored in the long term. Lake Kemijärvi is the most heavily controlled lake in Finland and the impacts of the control and nearby industry are obvious. It is used for hydroelectric power and is controlled for flood protection. Surrounding industries include forestry, farming; husbandry, fish farming, and wood pulp. Because of the human activities around the lake fauna and fish stocks have suffered. The littoral vegetation is becoming increasingly depleted. In addition, the dams have changed the waterflow of the lake, thus affecting the entire ecosystem. Finally, mercury from nearby industries also contaminates the lake. Hair studies of local residents who ate fish from the lake tested positively for mercury contamination. Mercury is dangerous even in trace amounts. Studies are regularly completed at the lake, but no remediation strategies have yet started. 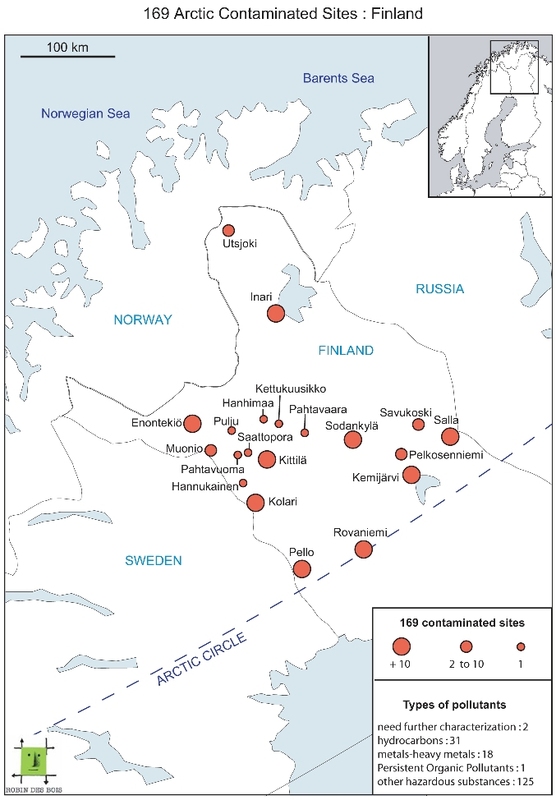 The complete inventory of the 169 contaminated sites within the Arctic Circle in Finland and their known characteristics are in the attached document (pdf, 22p., 44,6 ko). The majority of information concerning the Finnish contaminated sites database was forwarded to Robin des Bois from the Finnish Environment Institute, Expert Services Department of the Environment Damage Division in Finland. Access to this database is restricted. For further information on this database please contact the Finnish Environment Institute (SYKE) http://www.ymparisto.fi/default.asp?node=5297&lan=EN. Information concerning the mines that Robin des Bois added to the database was gathered from official mining internet sites; please see the section on works cited for further information. Martin Lodenius, Ari Seppänen, and Matti Herranen. Accumulation of Mercury in Fish and Man From Resevoirs in Northern Finland. University of Helsinki. 14 April 1982. Eleftheria Kampa, Wenke Hansen. Heavily Modified Water Bodies: Synthesis of 34 Case Studies in Europe. 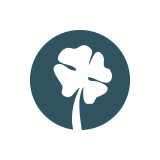 Ecological Institute for International and European Environmental Policy. 2004. Berlin, Germany. 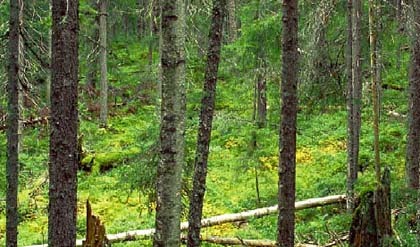 Finland – Forests and Forestry. Boreal Forests. Teija Haavisto. Finnish Environment Institute / Expert Services Department / Environment Damage Division. Helsinki, Finland. Juha O. Miettinen. 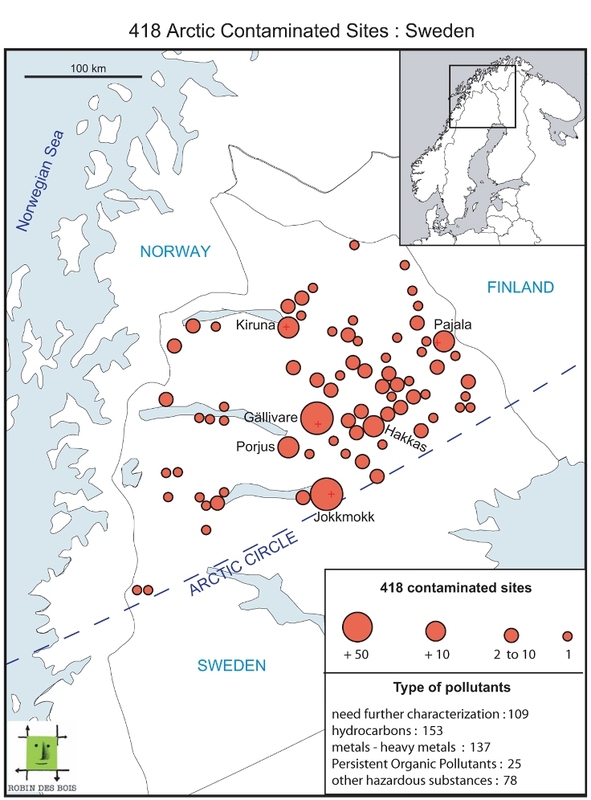 Effects of the Kola Air Pollution Sources in Finnish Lapland Surface Waters During 1990-2006. Lapin Ympäristökeskus. The Pechenga-Nikel Combine 1934-2004. Fridtjof Nansen Institute. Culture of Finland. Welcome to Finland. http://www.finlandonline.org/culture.php. Finland. Mining Journal Special Publication. February 2005, London. All that glitters is not gold; it may be cyanide. Grinning Planet. Pahtavaara – Gold Database. Geological Survey of Finland. 12 September 2008. Hannukainen – Gold Database. Geological Survey of Finland. 12 October 2009. Harold R. Newman. The Mineral Industry of Finland. U.S. Geological Survey. Mining in Finland. Global InfoMine. 2009. Exploration News 2009. Geological Survey of Finland. 7 December 2009. In spite of the “Ukaz” of the Presidium of the Supreme Soviet in 1984 entitled “On the Strengthening of Nature Protection in the Regions of the High North and Sea Areas adjacent to the Northern Coast of the USSR,” scientific stations, military garrisons, ship-building yards, mining activities, and the exploitation of fossil fuels cover Russia’s Arctic Coast and Polar Islands with drums, scrap, deads, rubble, and toxic waste. Since 1989, the Russian Arctic produced more than 2/3 of the nation’s fossil fuel resources. Deposits and exploitation of bauxite, copper, and nickel are some of the largest in the world. Half of the Arctic shoreline is under Russian responsibility. Despite Glasnost increasing since 1992, the Russian authorities have not responded to Robin des Bois’s requests for information. The Arctic territories of all neighbouring countries have created over time a line of polluted sites circling the North Pole but inventories are available and the understanding on the need to secure contaminated sites is going forward. In Russia, there are no inventories or they are not communicated. The lack of information on polluted sites often exposes indigenous populations and their food supplies. It also poses an additional problem for environmental governance of the Arctic. Further works on polluted sites in Russia’s Arctic, specifically radioactive pollution, will be published later by Robin des Bois.